Hungry for a gourmet burger? Get On It Burgers delivered to your door. Order your favourite burgers, chilli cheese fries and onion rings from an On It Burgers restaurant near you. Get On It Burgers delivered to your door! 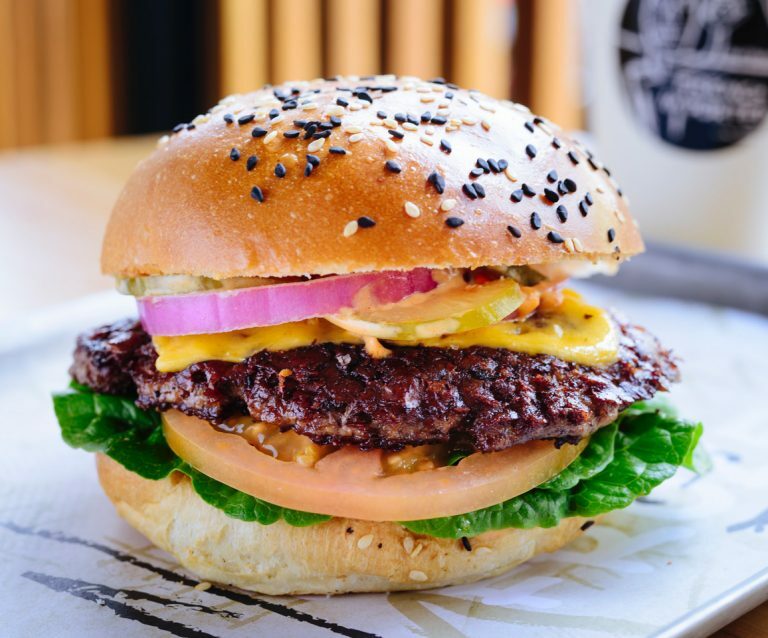 It has been an ambitious project to launch a gourmet American-style in Melbourne’s ‘Little Saigon’, but the gamble has paid off for On It Burgers. Taking pride in creating delicious burgers, On It Burgers use premium ingredients with 100% grass fed beef, with an emphasis on fresh produce. One of the most recognisable features is their black squid ink buns, a huge hit among burger lovers. Opened in 2016, On It Burger focuses on hand-made techniques to create their burgers, fries, sauces, dips and shakes, and now have three stores; Abbotsford, Ferntree Gully and St Kilda. Popular menu items include chilli cheese fries, onion rings and their range of tantalising dips. Enjoy a gourmet burger, in the comfort of your home, by a restaurant that knows how to make burgers, fries and onion rings that travel well. If you need that burger-fix, order your favourite On It Burger through Menulog, and you’ll be biting into a juicy burger without having to travel to indulge. Use the Menulog app or order online in a matter of minutes.